Enjoy up to RM40 off rides! GRABJE is back again! Time to go jalan-jalan with your friends and family. Use the Grab Promo Code GRABJE to enjoy RM4 off x 10 rides. Valid from 10th - 15th October 2017, all day long. Valid nationwide EXCEPT Klang Valley and Negeri Sembilan. Limited to 50,000 redemptions per day. Payment Method: GrabPay (credit/debit card) and cash. Promo validity: 10 – 15 October 2017 all day long. Quantity: 50,000 redemption per day. GRABJE to anywhere! Yesss la, GRABJE is back! Avoid parking hassle and enjoy jalan-jalan with your friends and family. 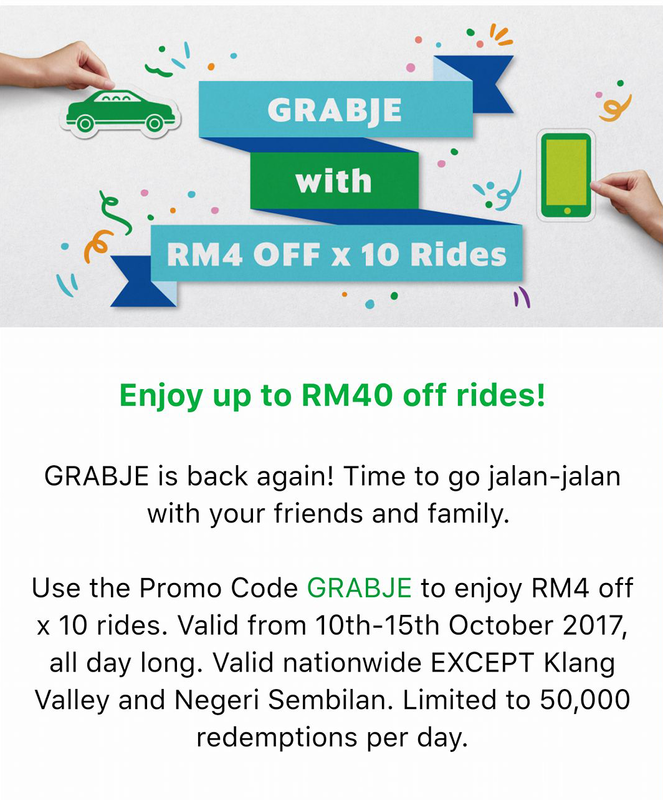 Use the promo code GRABJE to enjoy RM4 OFF x 10 rides. Valid from 10 – 15 October 2017, all day long. Valid nationwide EXCEPT Klang Valley and Negeri Sembilan. Limited to 50,000 redemptions per day. This promo is valid nationwide EXCEPT Klang Valley & Negeri Sembilan. This promo is valid on GrabCar, GrabShare and GrabTaxi. It is not valid on special icon. Available for GrabPay (credit / debit card) and cash.